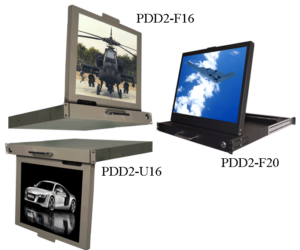 The PDD (Pivot Display Drawer) series is a high performance 1U (1.75″) display drawer. Because of the shorter depth the series has a limited of LCD options (excluding the PDD2-F24), but the short depth allows for many unique features. 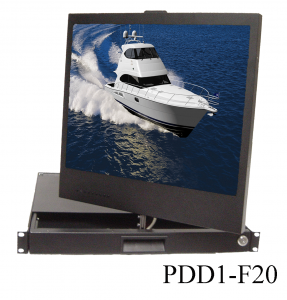 The PDD1-F20 lets the display actually pivots on a center axis. The display lays flat in the in the drawer and when pulled up it can pivot up to 180 degrees in either direction. Similarly to the way your head rotates on your neck. The PDD2 is similar to the PDD1 but without the ability to rotate on a center axis. 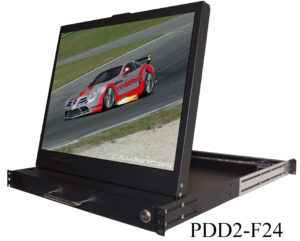 Within the PDD2-F series there is the PDD2-F20 which lays flat in a 1U drawer but when needed can be pulled out and rotated up to 125 degrees. The PDD2-F16 is just the the PDD2-F16 is just like the PDD2-F20 but smaller (16″ deep) and lighter (14lbs). It is the smallest and lightest unit like it on the market. If you prefer an undercount monitor (where the drawer pulls out and the display rotates down) The PDD2-U16 is your go to choice. The display lays flat in the drawer and when needed is pulled out and then rotated DOWN up to 125 degrees.